The New Year kicked off my training program. The Burning River 100 Mile Run in Cleveland, OH was still 8 months away, but it would be my first 100 mile run and I wanted to be ready. 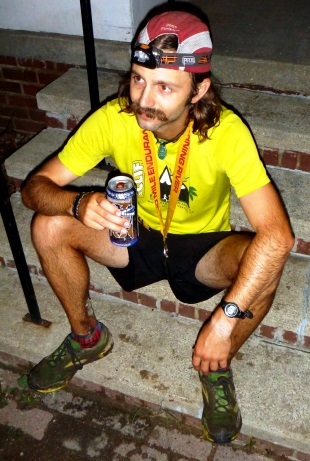 In the 18 months since I’d finished thru-hiking the Appalachian Trail I had experimented with (read as “got addicted to”) ultramarathon running. Marathon? Check. 50K? Check. 50 Mile? Check. 100K? Check. It only made sense to get the next high, finishing a 100 mile run. Of course, the next question is “Why?” Why run 100 miles? Good question. It’s sort of like “Why hike the Appalachian Trail?” Why not!? I don’t think I have a good answer that anyone who hasn’t done it would understand. In attempting a 100 mile race, much like a long distance thru-hike, I was looking for the highs of highs and lows of lows. It seems like the lower the lows the higher the highs. I wanted to dig deep, find new lows, and experience new incredible highs. Luckily, I wouldn’t have to worry about it, the lows would definitely come, and would definitely test me to my core. Spoiler Alert: It would be worth it! I secured a crew and pacers early in the year. My brother Tyler would fly in from Santa Barbara. My friend Ryan Stemen was getting into ultrarunning and lived in Cleveland so he’d be our local resource. Jon Weaver was putting down half marathons like nobody’s business and could drive over to complete the crew. I was set…or so I thought. As is the case with most great ideas, it started with another round at the bar. Tyler was in the Midwest for a friend’s wedding and much the way I found myself registering for my first 100 mile race, Tyler was peer (beer?) pressured into registering for the Burning River 100 as well. The biggest problem was that Jon Weaver had prompted the registration and was now crewing Tyler…at least I still had Stemen! Tyler worked out his own race plans and I brainstormed ideas on additional crew members. A month before Burning River I was running the CYA race with Maria Walton and Jess Soco in Prescott, Arizona and a crazy thought entered my mind. “Hey, what are you both doing on August 2nd? Have you ever been to Cleveland? Do you want to go?” Maria is an accomplished ultrarunner and the Race Director of the Ultramarathon Caballo Blanco in the Copper Canyons of Mexico. Jess is also an accomplished ultrarunner and just recently finished the Western States Endurance Run as one of the few people in history who have run the entire race in sandals. I was in good hands. It was settled, we booked the flights and my All Star crew was set. Ryan Stemen, Maria Walton, and Jess Soco. Let the fun begin! The first weekend of August 2014 we descended on the city of Cleveland. Maria and Jess few in Thursday night and Tyler, Tim Davis, and Jon Weaver all arrived on Friday. Our friends Laurie and Radames (awesomest name ever!) Colón offered their house for a group of dirtbag trail runners. 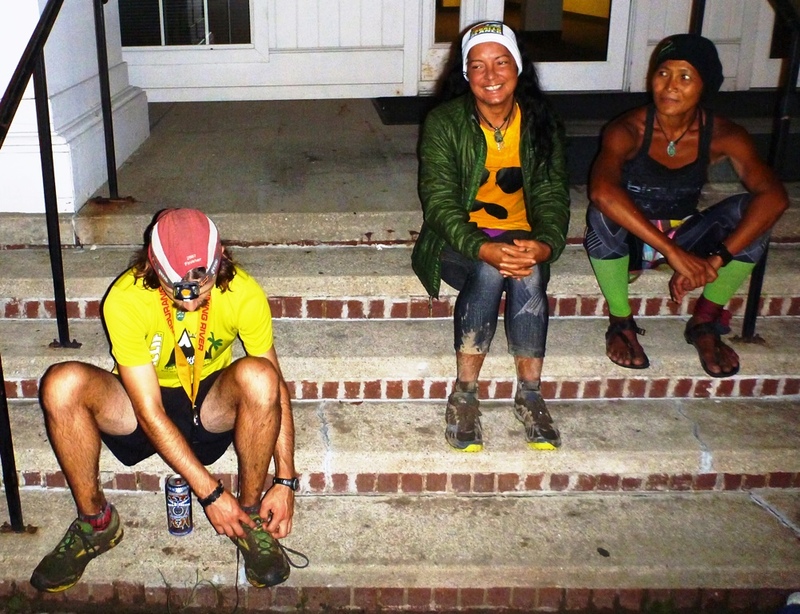 Laurie is a Mas Loco, a runner who has traveled to the Copper Canyons in Mexico to run the Ultramarathon Caballo Blanco, and she was excited to reconnect with Maria and Jess. I picked Tyler and Tim up from the airport on Friday morning and on the way back to the house we bought a cube of PBR…oh no we didn’t….but oh yes, we did! How could we all get together and not run a beer mile? Sure, Tyler and I were running our first 100 mile race the next day, but I’ve always heard you should race the way you trained! We marked out the 1/8 mile course on the street in front of the house, divvied up the PBR’s and toed the line. 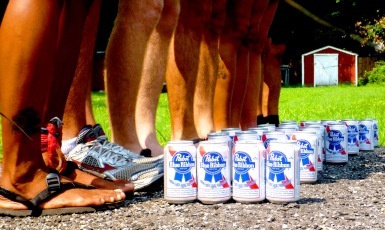 We had some beer mile rookies, but they understood the rules. Drink a beer, run a quarter mile, repeat, repeat, repeat. Simple. We took the oath, “I can drink more than I think I can. I’m drunker than I think I am. I will not puke. Amen.” Go! The First (Annual?) Burning River 100 Beer Mile was underway. Radames and Tim took of strong and ultimately finished 1st and 2nd. Tyler made it almost through his second beer before it, along with the morning’s breakfast, made a reappearance in the bushes. DNF. As the reigning beer mile last place champion (I’ve never finished better than last place), I wasn’t in a hurry. Everyone joined me for my last quarter mile stretch, and trying to be sneaky I took off at a dead sprint trying to beat everyone. Tim caught me but stopped at the finish line as I continued sprinting straight for the bushes to empty my stomach. Beer mile complete, and I got rid of most of the beer in my system. Now it was time to get ready for the 100 mile race, or so we thought. Next up was something a little more serious, race registration. With our stomachs still bubbly we headed over to pick up our race packets. We spent a good hour driving through Cleveland rush hour traffic and when we arrived several of us immediately jumped out of the cars and took a pit stop in the trees next to the parking lot. 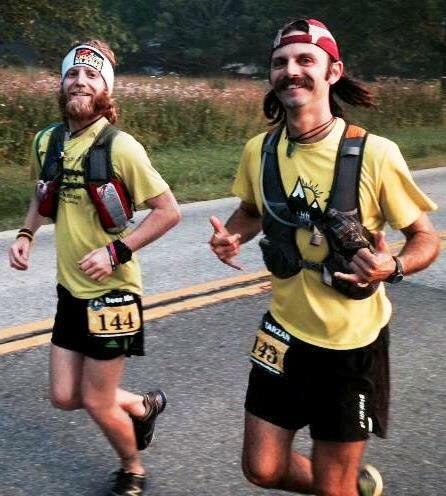 We were dirtbag ultrarunners for sure. Tyler and I registered for the race, took some photos, and headed to Chipotle for the pre-race dinner. We made another stop at a grocery store to pick up last minute supplies, dropped Mom and Tom off at their hotel and returned to the Colón house to pack the gear for the race. By 10:00 PM I was sprawled out, drifting off to sleep. I wasn’t nervous or antsy, I felt like I had done all I could do to prepare for the race, now the only thing left to do was show up and get it done. Shortly before 5:00 AM the unorganized mass of humans in neon shoes and reflective shirts consolidated into a semicircle around an imaginary line in the grass. We received the final instructions and someone shouted “Go!” We were off, running across the wide open lawn that was so covered with dew that it ensured none of us would make it through the first quarter mile with dry feet. The first 13 miles were on paved roads. Headlamps bounced through the dark as we ran through the woods and to the riverbank. Darkness turned into gray, illuminating the low hanging fog in the valley and highlighting the hazy sun peaking over the hilltops. The road lead past an elegant row of country estates sprawled on hills overlooking the river. It was very picturesque, and then we spilled out onto a 4 lane highway. The cars whooshing by helped wake me up more than strong coffee and made me appreciate the quite roads and forest even more once we turned back into the park. Our first crew stop was mile 13 and we could see our team shirts a mile away. I ran in with Tyler and James Moore and quickly headed to the aid station. Our crew members jogged behind, asking what we needed and how they could help. My experience pacing for Western States taught me to get in and out of the aid stations as fast as possible. I ran in, grabbed some food, asked Maria and Jess to roll out my hamstrings, refilled water, and took off. As I headed back into the woods I realized that wasn’t any fun at all. I had just covered 13 miles and had the opportunity to see my friends and family and I didn’t even get to enjoy them. From now on I’d try to slow down, just a little. Having Jess roll out my hamstrings was a lifesaver. From the first mile my hamstrings had been so tight I could feel them pulling like taunt rubber bands on the verge of snapping. I wasn’t happy about it. Not only did it hurt every time I took a stride, I had actually never had this problem before, ever. Fancy that, the first time I’d ever have this pain would be in mile one of my first 100 mile race. Maybe it was sprinting the beer mile the previous day? Maybe I shouldn’t have done that? Stop…it was going to be a long day regardless and I didn’t want to spend the next 24+ hours going over scenarios in my head, what if’s, and all sorts of non-sense. Pain or no pain it was time to just run. I had run most of the first 13 miles with James Moore, but I knew I was going too fast. Many of the early miles were ticked off at close to a 10 minute pace, definitely not sustainable for me. After the first aid station I watched James bound off in his blue shirt and settled into my own pace, a little slower and hopefully more sustainable. Tyler and I ran together for a few miles after the aid station, until nature called and luckily I spotted a parking lot bathroom. I peeled off the course off to reduce body weight while Tyler pushed on. We had decided that we would not plan to run together through the race. A 100 mile race is long and if we tried to stick together we’d slow each other down trying to compensate for the highs and lows we’d both have at different times. Trying to finish together could ultimately ruin the day for both of us and we needed to run our own races. That being said it was nice to run with Tyler when I had the chance. It was still early in the race and I wasn’t pushing myself, but I ran when I could and walked when I couldn’t. I didn’t run fast, I just ran. As we approached the next crew aid station at mile 24 I caught up with Tyler and we ran to the mile 29 aid station together where we’d see the crew again. I was still in pain with my hamstrings bothering me, but heck, we were over a marathon in. At the aid station I had Jess and Maria work on my legs again, wincing in pain as they rolled out the tight knots. I refilled water and ate food before heading back out on the trail. This time the rolling did the trick and my hamstrings were perfectly fine the rest of the race. I left the aid station in front of Tyler and wouldn’t see him again until he passed me in the middle of the night at mile 85. I headed back out on the trail alone and happy to be running my own race and in my own head. I followed the beautiful trails through dense forest and alongside cascading waterfalls in slate filled gorges, amazing scenery that I didn’t have time to stop and appreciate. I eventually caught up with a group of energetic runners. Two of them had just finished the Badwater Ultramarathon a few weeks before, the same weekend that I was in Death Valley crewing Luis and Mauricio through the Badwater 146. I enjoyed running with the group as they shared stories, jokes, and sang songs from Ren and Stimpy. Eventually I put space between myself and most other runners as I found it easier to run in silence, listening to my body, my pace, and the sounds of the woods. From there I ran 6 miles to the half way point and another 4 miles to the new crew stop. When I arrived at mile 54 I recognized Dan Crouse in the crowd. He asked how I was feeling and I answered “Well, I just ran 50 miles in under 10 hours.” Surprised, he asked, “Why the heck would you do that! ?” Good point, that was pretty fast. I hadn’t intended to go that fast, I just ran when I could and walked when I couldn’t, but a 10 hour 50 mile was going to be very hard to run a negative split on. 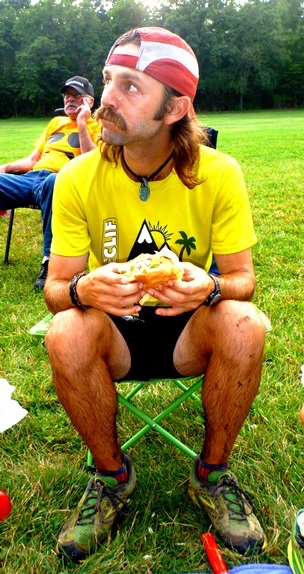 I grabbed food as Ryan suited up for his 20 mile pacing duties. We bid adieu to our crew and left the aid station area, only making it half a mile before my stomach started calling the shots. I jumped into the woods while Ryan waited patiently. We ran on, but I would have to answer nature’s call 3 more times in the woods during Ryan’s 20 miles. Ryan had run a lot of the trails before and he fell in behind me as I pushed head. In addition to beautiful trails we ran along a never-ending, slightly uphill, fully annoying, very straight bike path. My complaining started surfacing but eventually we turned sharply and headed back to a single track trail in the woods which saved my sanity, for now. My longest previous run had been 65 miles and as we approached mile 66 we were entering uncharted territory. My crew had a special treat for me at the mile 66 aid station, a McDonald’s Big Mac, which was not quite uncharted territory. Many of my local training runs had been through town with a planned stop at McDonald’s for food. I jogged into the aid station and sat down for the first time since mile 18 and enjoyed the golden arches goodness. Less than half way through the sandwich my internal “get the heck out of the aid station” alarm rang. I stood up, grabbed my pack, and asked the crew for more toilet paper. They left the TP roll in the car but handed me a few paper towels. Thank goodness, those would become necessary, very necessary. Ryan and I ran again heading to the Pine Hollow aid station where Maria would take over pacing. We crossed several open fields, ran within 20 feet of 4 deer, and watched the light fade to dusk. We rolled through Pine Hollow aid station for a 3.5 mile loop that I hoped would bring us back in less than 45 minutes. So far during Ryan’s pacing I had been making solid progress but this loop started showing the difficulty of the course and what I could expect through the night. The light was fading, the climbs became steeper, and the mud sunk deeper. By the time Ryan drug me back into the aid station I was in a bad place and looking for a second wind. We started hitting some mud, but the real kicker was the cornfield. Yea, we ran through a freaking cornfield. It was weird, but it was good timing as both Maria and I are born and raised Hoosiers. Cornfield? Weird. We rolled into the Covered Bridge aid station and Maria gave me a cup of chicken noodle soup. I sat down to eat while the aid station volunteer refilled my water bladder. He was having a hard time closing the reservoir and it was ticking me off. I sat in my chair eating soup and saying, “Maria, let me do that for him.” They eventually figured it out, but by the time Maria grabbed her soup to eat I was frustrated and told her it was time to go. I was entering a low in the race (and apparently my life) and I desperately wanted to get my positive attitude back. We left the aid station, me deriding Maria about wasting time at the aid station and hoping that the next 4.5 mile loop would get me back on top. Little did I know that we were heading out on the hardest 4.5 miles of the entire race. We entered the single track trail and I realized that my headlamp was dimming and I forgot to grab new batteries. I used it until I couldn’t see anything and turned to give it to Maria. Luckily Maria had packed an extra headlamp and I put it on and complained that was just as dim. Maria just couldn’t win with my attitude. The easy 4.5 mile loop turned into an eternal death march. Right off the bat I could see headlamps streaming high above us on a steep hillside. Anytime I thought the trail might be runnable I would take 3 steps before sinking into a sticky muddy mess. The mud wasn’t just wet mush, it was gummy slop that actually pulled one of my shoes off. Maria followed behind while I cursed the mountains, the mud, and the energizer bunny for failing me. We continued our slow forward progress and I kept telling Maria, “When we get back to the aid station I need just a minute to get my life back in order.” The wheels were falling off, and not just of my race, apparently my entire life was in a downward spiral! Eventually two headlamps bounced behind us and I thought that James Moore and his pacer had caught us. I had my head down, focused on a climb as two people passed and said “How you doing?” “Fine” I replied and saw Tyler and Tim power hike past. 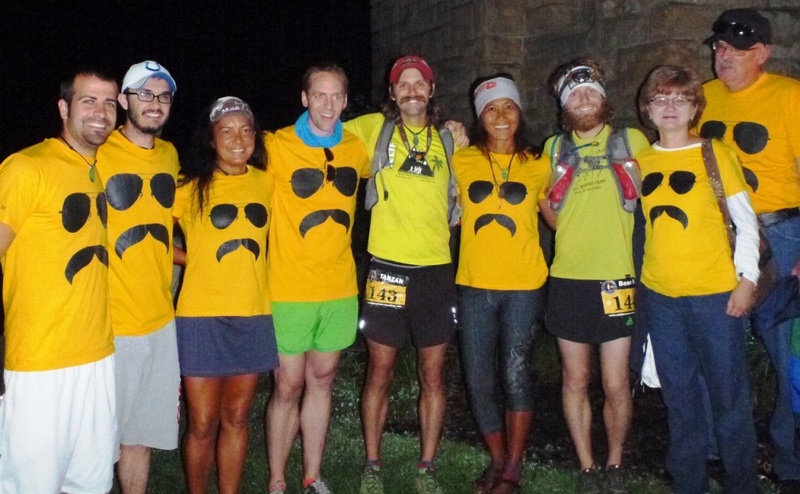 I hadn’t seen Tyler in 50 miles and they were looking strong as their headlamps disappeared into the darkness. I didn’t care that Tyler was passing me. I didn’t care which one of us crossed the finish first, just that we both finished the race. Heck, the way I felt I didn’t care about anything other than getting back to the Covered Bridge aid station, let alone the finish of the race! A few switchbacks ahead the hills caught up to Tyler too and Maria and I passed as he was cursing the mountains, the mud, and the GPS watch that told him we should be back to the aid station by now. Maria and I made it back to the Covered Bridge aid station and I told her not to sit down, we weren’t going to let this mess us up again. I walked to the water and stubbornly filled my own reservoir, drank soda, ate food, and told Maria it was time to go. Tyler was sitting down in a chair eating soup and I shouted “Don’t stay here long, it’ll f*** you up!” as we pushed out into the dark. Maria had 5 miles left of her pacing duties. She was trying to pep me up, but I didn’t care. We ran 2 miles on the road and I picked out landmarks to run between. Light pole to light pole, mailbox to driveway, tree to stop sign. I couldn’t run far, but running anything was better than walking everything. We had another 2 miles through the trails and I complained our way out onto the road that lead us to the Botzum aid station at mile 91. As we approached the aid station Maria asked “Do you want to change shoes?” No. “Do you want to change shirts?” No. “Do you want to change packs?” “No, No, NO! Maria. I’m 90 miles into this thing…whatever I have going on right now is how I’m going to finish it. I’m not changing anything.” In my mind I was thinking “Maria, will you please just shut up! ?” I found out later that it wasn’t just in my mind, I actually said it several times. Oops! Sorry Maria, but at least I said please! We rounded the corner to hear the generators and see the lights of the aid station. We approached and I saw my crew, walked straight past them, dropped my pack on the ground, and collapsed on a lime green plastic lounge chair. I curled up in the fetal position with full intentions of never getting up, ever. “I’m done. I’m not quitting, but I’m done” I told my mom in an utterly confusing statement. I was sleepy tired and my knee was in incredible pain. I didn’t know how I’d make the next 9 miles, but I knew that I had to. But first, I had to wake up. “What do you need?” the crew asked. “Coffee. Caffeine, but not soda, it won’t keep me awake anymore.” For some reason the aid station had no coffee, but they gave me some caffeine beans, which didn’t help. I sat with my head in my hands and actually started to cry. What the hell was I doing. How the hell would I finish this. Why the hell did I even want to do this? This was the low of lows that I was searching for. Time to get my act together, I had more work to do. I sat up and tried to eat. I downed some Mountain Dew for good measure and prepared to get out of the aid station. After a little commotion Tyler came barreling into the aid station and made a beeline for the mat on the ground next to my chaise lounge. He fell to the ground on his back while Jon and Tim moved around him to get him refueled. At this point Mom leaned over on Tom, we warned her that it was going to get weird, and while this was a definite low point in the day for both me and Tyler, it was probably even harder on her. I leaned back on the chair and tapped Tyler, “Hey man, I’m gonna walk out of here, I can’t run anymore, I’m f***ed up. I’m just going to walk, you’ll probably catch me. If you do, and if we’re both about the same speed, we’ll take it in together. See you out there.” Tyler told me that his knees and ankles were messed up too and he’d see what he could do. In the meantime Maria pulled Jess aside and gave her the pacer scoop. Don’t talk to him, don’t ask him anything, just stay quiet and let him go. She told Jess I was in a pretty dark place but eventually I’d “get my life back in order”. Somehow I stood up, put on my pack, and turned for the dark path leading away from the chaise lounge. Jess followed close behind. A paved bike path lead out of the parking lot and straight downtown. A skunk scampered out onto the path running straight at us. Before it turned off into the tall grass I thought, “Hey, what is that little guy in a tuxedo doing out here?”, the closest I got to hallucinating, other than thinking that my life needed to get back in order at every aid station. Jess let me do my own thing. Having a new pacer renewed my yearning to impress someone in my first 100 mile race. We walked for awhile, but I eventually tried to run, 20 seconds here and 30 seconds there. The 5 miles to the next aid station ticked by like counting sheep. I was tired, so tired that I started weaving back and forth while walking on the path. I stopped several times, put my hands on my knees, and tried to “focus” myself awake. Once I was “focusing” when Jess startled me awake by saying “Do you want to do some jumping jacks?” Heck no I don’t want to…wait, was I sleeping while standing up? Ultimately I realized that running was the only thing that would keep me awake. Well, that, or having Jess punch me in the face. Running, as painful as it was, would get me to the finish line faster, and without a black eye. So, half way asleep at 3:00 AM in the pitch dark, we ran (actually ran is probably an aggressive term, we shuffled briskly forward). The sounds and lights from the final aid station finally filled the dark night. Jon and Ryan had made a stop at 7-Eleven to find the coffee machines empty. Ryan took matters into his own hands and made a special ultrarunner blend, double strength bold coffee. They handed me a cup of laser and I started gulping it down. We had less than 5 miles to go and Jess finally spoke up, “Let’s go. You can drink that while we walk.” Yes mam. With that, we were out of the final aid station and on the way to the goal. The coffee did the trick. We walked a few minutes while I chugged the black diesel and Jess stuffed the cups into my pack when we started to run. We left the road and followed a single track trail. I was buzzing from the stimulants when Jess said “We’ll run it in”. Okay, I couldn’t argue with that. We started cranking out miles and I started talking more about the trail, the race, and the parts that I really enjoyed. We passed another runner in the woods and never looked back. As we approached the bridge I knew we were close. We climbed out of the woods and crossed the river. I knew the finish line was ahead and we pushed up the hill to the center of town. Eventually I saw the red numbers of the official time clock. Even more prominent were the bright yellow Team Clemens t-shirts running out to meet me. 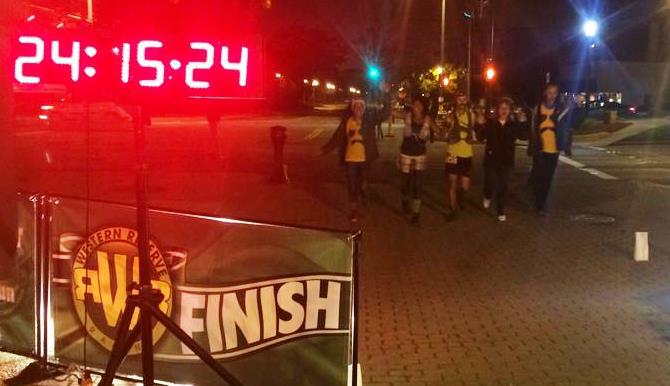 The crew all grabbed hands and with Mom right beside me we ran together across the finish line. 24 hours, 15 minutes, and 26 seconds. 100 Miles, complete. Jess and I had killed it on the last section, running the last 5 miles in the 14th fastest time out of everyone that day. I placed 31st overall out of the 132 runners that finished the race. Just over 250 people toed the starting line the previous day. I hugged everyone and walked over to the steps to finally sit down, crack open a celebratory beer, and take my shoes and socks off for the first time since the start. No blisters! I was incredibly happy with my shoes and lucky that I had no problems. I laid out my sleeping bag on the concrete steps and promptly fell asleep. Half an hour later I woke up, alone on the steps, with an intense urge to pee. Typically that’s not a problem, but my legs were so tight that I had no idea how I was going to even get up. Maybe I should just pee right here…it’d warm me up…gross. Eventually I rolled over, got on my hands and knees, and got upright to find some bushes. I hobbled around the finish area a bit and then heard the cheers from our crew as Tyler approached the finish line. He crossed at 25:27:52 in 41st place and happy to be there. He grabbed his beer, took off his shoes, and then commandeered my sleeping bag for a nap. Soon our other friends James Moore and Nate Stanis crossed the finish line and we all celebrated the completion of our first 100 mile finishes. Ryan took us back to his house where we cleaned up, took naps, and barbequed on the back patio. I was incredibly sore and my knees were the tightest I’d ever felt. After a good night’s sleep I woke up Monday morning with much less pain and a lot more mobility. This was good because not only did I need to take Jess, Maria, and Tyler back to the airport, I had to drive 4 hours back to Indiana in my 5-speed manual car. Before dropping everyone off at the airport we had breakfast in downtown Cleveland and visited a running store to buy compression socks for Tyler’s flight home. The weekend had been an amazing success, from the beer mile, spending a full day out on some beautiful trails, and doing it all with great friends. The weekend was another in a line of amazing adventures we had all shared recently and it was bittersweet dropping everyone off at the airport. I know that I couldn’t have made it without them. Our crew was amazing, even Jon Weaver (he dumped me for Tyler). 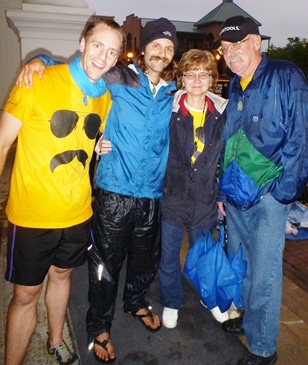 Jon and Tim were great with Tyler, especially considering neither had ever been to an ultra event and both ran the longest distances of their lives to pace him. 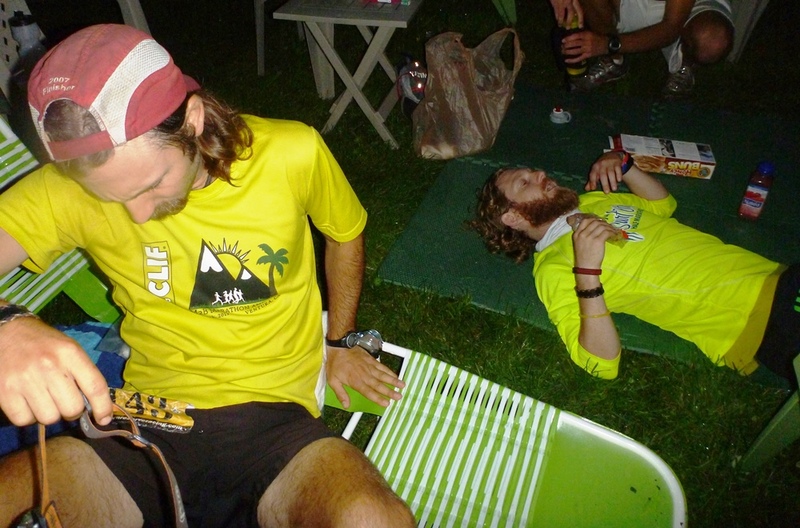 (Tim even completed his first ultramarathon!) My crew was fantastic. Ryan Stemen was a huge help and his positive energy kept me pushing ahead when I didn’t feel like it. Plus, that coffee saved my race, and maybe even my life (or at least it helped me get my life back in order). Maria and Jess brought the experience and poise that would ultimately make both Tyler and I successful. We are lucky to have amazing friends like them. A big thank you to Laurie and Radamus and Jaimie (Ryan’s wife) for hosting a bunch of dirtbag ultrarunners in Cleveland! Also, I really enjoyed having Mom and Tom there to experience the magic (and weirdness) of the event. Mom had never been to see me run a marathon and she had only watched Tyler run once in the ill fated 2013 Boston Marathon. This time she was able to watch both of us push ourselves harder than we had ever pushed to achieve something greater than we ever have. And even though he screwed up my crew plans (for the better I might add), I’m glad Tyler decided late in the game to sign up and complete his first 100 mile race with me. Ultimately, I got what I was looking for. There were some high highs, and some seriously low lows. I learned a few things. I need to work on patience, composure, and emotional control. I wasted a lot of energy fighting the lows instead of using it on the course and forward progress. 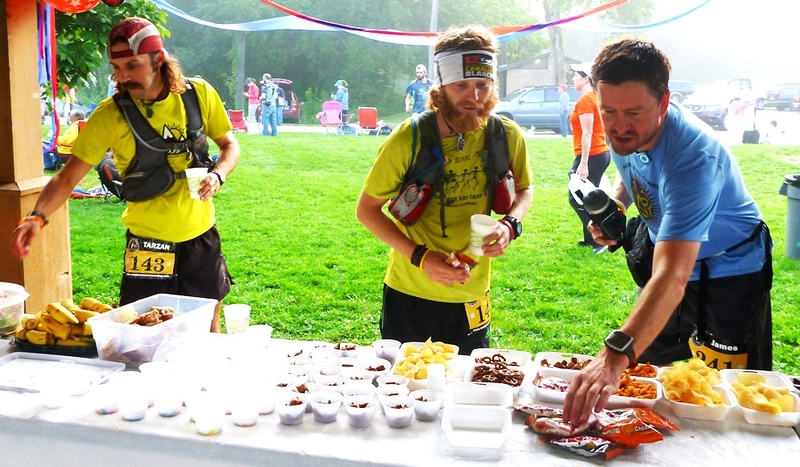 The Burning River 100, while not easy, is also not hard. Finishing the Burning River 100 qualified me for the lottery of the Western States Endurance Run, which is cool, but there I’ll be facing mountains at higher elevations rather than the rolling hills of Ohio. I’ll have some work to do. I learned a lot from the Burning River 100, but most of all I learned that there are new lows that I’ll be encountering soon, and I’m looking forward to those dark moments. If you want to know what my first 100 mile race was really like, read this firsthand account from my pacers, Ryan Stemen and Maria Walton.